Sangu is the term for the three principle armor parts which protect the extremities of the samurai. These parts include the kote, haidate and suneate. We’ve included the sode because we feel they are important in understanding the most elemental parts of Samurai armor. Learning about these parts is essential for understanding the functionality of a samurai gusoku (matching armor set). In the early periods, the Samurai warriors mostly fought on horseback. Later, as ground infantry troops, changing their tactics as the warfare styles changed and evolved. These changes in tactics also affected the way they crafted and wore their armor. We are going to review some of the most basic parts, their function, appearance and the key elements which led to their evolution as well as effectiveness in combat. We will review these essential armor parts in the same order in which they are donned. The 14th century was a time of intense conflict, as a result many important armor advancements and additional items came into play. One of the armor pieces which came under development were the Suneate, or shin guards. Kyahan Suneate (basic) – which is a simple cloth guard with splint plates. 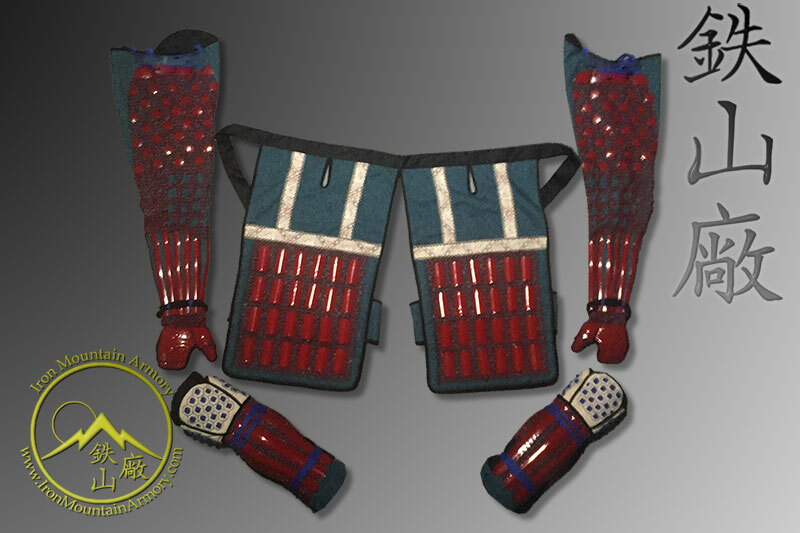 Shino Suneate (light) – these have splint plates connected by chainmail, cloth knee guards with kikko (metal hexagon plating) inside. Tsutsu Sunate, or Bishamon Sunate (medium) – these consist of three or more plates connected by the lacing and hinges, plus additional extensions with kikko to cover the knee. O-Tateage no Suneate (heavy) – this style would consist of either a single plate, or three plates laced/hinged or riveted together with a solid knee cup. The haidate is a form of armored apron that ties around the waist or may hang from the Do itself, to protect the thighs while resting under the gessen (armored skirt). This is the second piece of armor donned by the samurai while dressing in their armor. As combat tactics changed from mounted combat to ground combat and scaling walls, so did the armor design. However haidate didn’t catch on easily. The haidate designs came advancing in design during the second half of the 14th century. This was, in part, due to the shorter lengths of the haramaki versions of Do chest plate armors. To add the necessary protection, the haidate, came into full production and use. As the horseback to foot combat styles evolved, Samurai warriors needed a way to protect their thighs when mounted but something that could be easily discarded while on foot. Most samurai claimed that the haidate was added weight and refused to wear them while on foot. Eventually, their Daimyo won the argument when the amount of thigh wounds increased. It wasn’t long until the haidate became a permanent part of a samurai’s armor set. Many warriors preferred to avoid anything that would hinder their speed and flexibility. As they became more of a necessity, they evolved into the essential tools of warfare by adding leg straps, iron plating, leather and even chainmail sections. 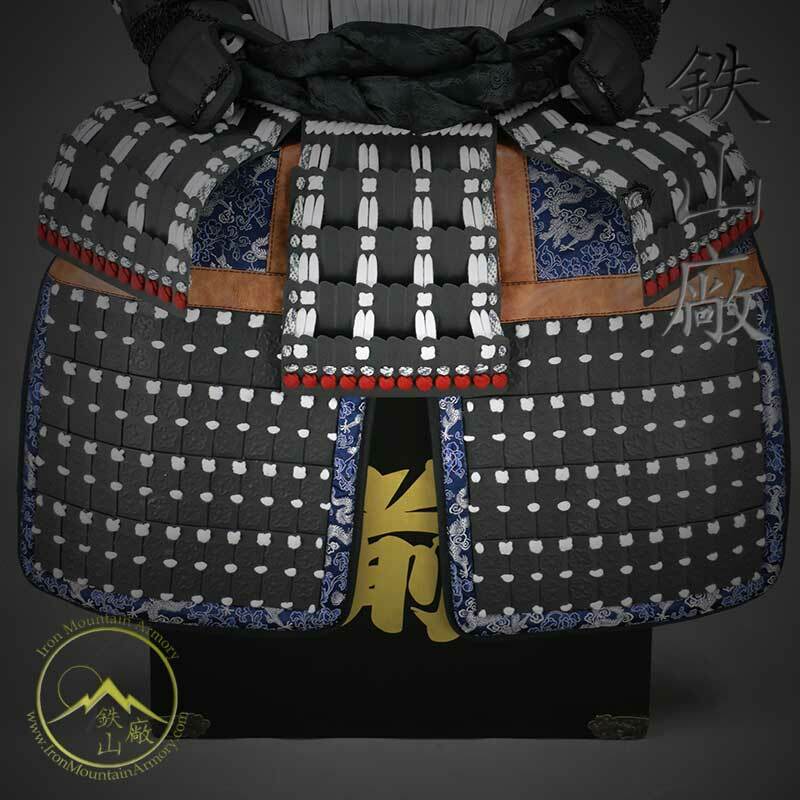 Although not technically considered “sangu” one of the most iconic protective points of Samurai armor, is the sode. It was created to be a shoulder/arm guard which would protect this part of the body, by acting as a shield – while still allowing ease of movement for the warriors. Chu-Sode – a medium sized version of the O-sode which allows for greater ease when fighting on foot. O-sode – a large shield-like design with long, broad, iron strips, held together with silk odoshi (lace). This style is well-suited for fighting on horseback. The development and evolution of Sode armor came about based on warrior fighting styles. With the principal fighting style of the Samurai being mounted archer, the O-sode functioned as a shield. It was mounted on the shoulder so the warrior had both hands free to work his bow. It would not interfere with the string or with his style of sword fighting as long as it was worn properly. This was the perfect defense for mounted archers and protected them from missiles (i.e. arrows) while on horseback. Each sode features an ornate brass fitting with ring on the back, or mid-section of the sode called “Byo no Kogai Kanamono”. A rope called “Midzu nomi no o” passes through these rings and tie to an ornately tied bow on the back of the Do (cuirass) called “age maki”. This prevents the sode from falling forward over the chest of the samurai warrior. A piece of hemp cloth, called “sode-jirushi,” was usually attached to this ring as well. It was colored or adorned with a mon (logo-like symbol) denoting clan, unit number and maybe even a name. 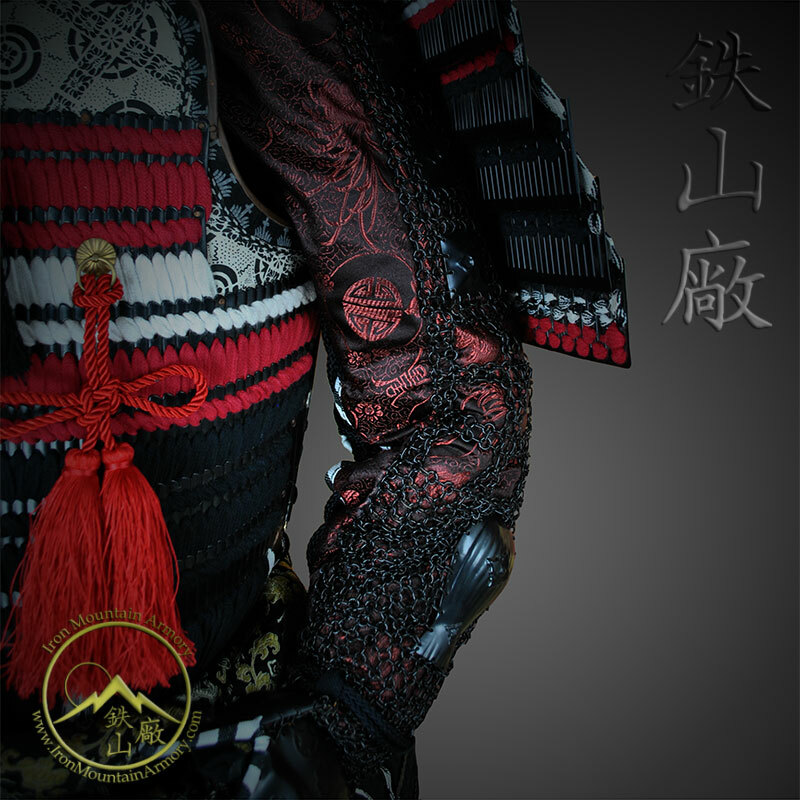 The kote is basically an armored sleeve worn by the samurai to protect the outside of the arm during combat. There word kote is a general term, then a word is added to kote, making it a specific style of kote, the word becomes “gote” (go-tai). Although there are many styles of kote, most fit the same basic profile. Often made from hemp or silk, with attached armored plating. Coverage starts with the tekko (a plate covering the back of the hand), followed by the wrist covered with kusari (iron mail). The kusari then connects to armored plates, usually 4 to 6 splint like plates, that continue over the forearm to the elbow. These armor splints connect with more kusari and other smaller splint plates that continue up the triceps to the shoulder, where the armor finally terminates. The sleeves can be tied around the body or attached to the armor in various ways. The inside section of the sleeves typically did not have any kusari, or armor plating, and was simply a continuation of the material to form a full sleeve, which was then laced together from wrist to armpit. The inside of the kote wasn’t armored. This was to avoid snagging and scratching of the Do. It is also important to know that the samurai wears a silk kimono with wide, drooping sleeves, which are wrapped around the arm. This extra silk material, when wrapped properly, acts as a cushion and extra protection against sharp blades and the pointed tips of enemy weapons. By understanding the development and purpose of each Sangu (or element) of your suit of armor, you will gain a greater appreciation for their use. 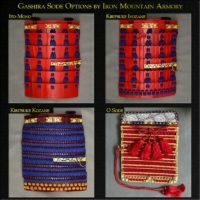 Ask us about our individually designed “sode jirushi’s” which you can customize according to your clan logos or symbols in order to help you and your clan stand apart while on the battlefield. 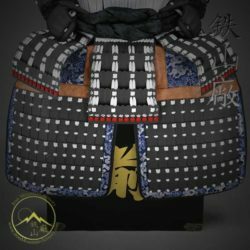 Here at Iron Mountain Armory, we strive to research original samurai armor so we can reproduce it the way it was meant to be. 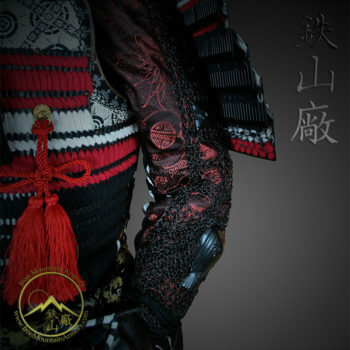 The result is a quality reproduction which matches the strength and functionality of the original samurai armor. 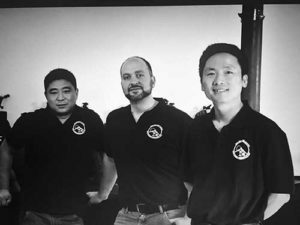 To learn more about the Armory check out our About Us page. To purchase or learn more about our Sangu and Sode Armor Parts go to our Sangu Section of the website. For newbie Samurai enthusiasts, the names and pieces of the armor suits can be confusing and even a bit overwhelming. Try to construct a mental picture, but at the same time mindfully realize the purpose and intent of each part. The designs are really quite incredible. First, in that they weigh less than traditional European armor of the same individual time periods. Secondly, they are also easy to repair and can absorb more of the impact while still allowing freedom of movement. We are honored that you took the time to read our blog and hope you will check back frequently. More articles are in the works. We are working to raise awareness and understanding of the quality of the armor we recreate while helping our audience gain a greater understanding of Armor Parts use and potential. 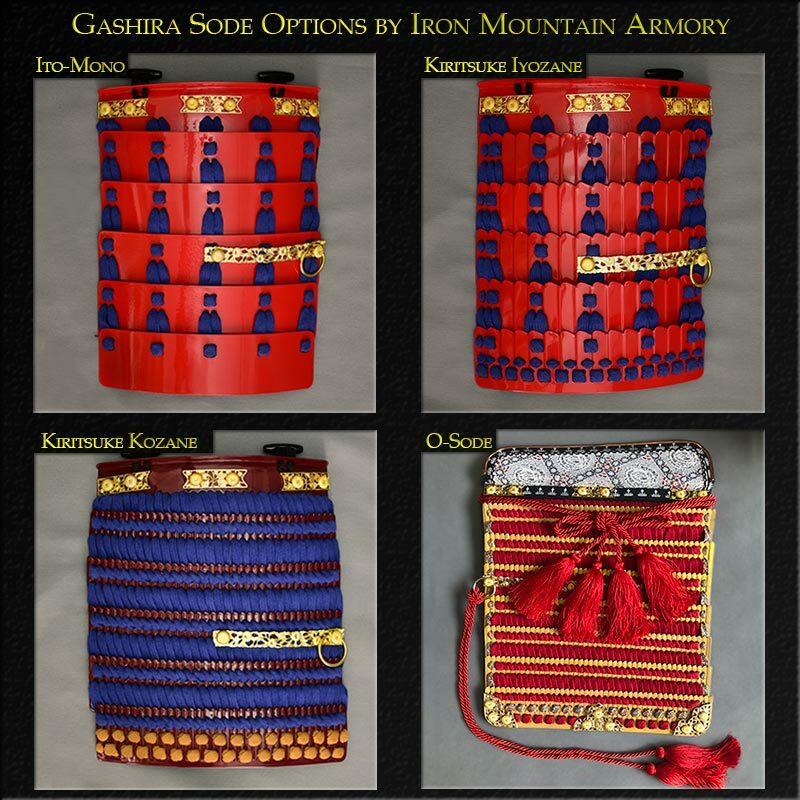 This entry was posted by Erin in Gendai Samurai Armor and tagged Sangu and Sode Armor Parts.